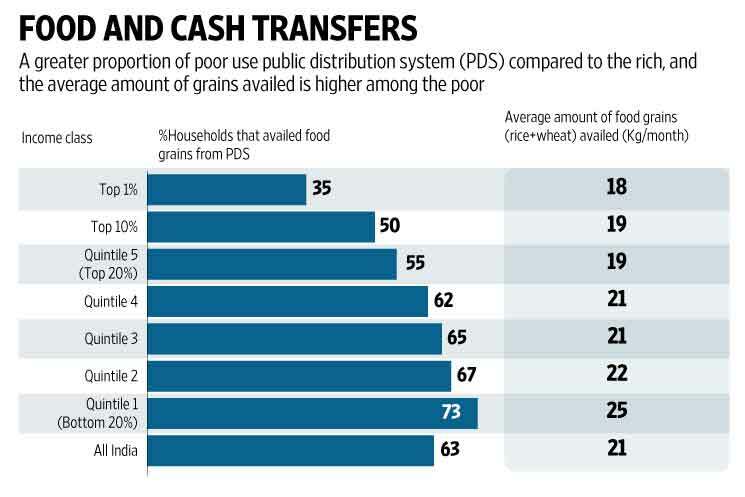 New Delhi: The poor use India’s massive public distribution system (PDS) for foodgrains much more than the rich, and rate the quality of grains more favourably than richer income classes, a large-scale nationally representative survey conducted this year shows. The ‘Household Survey on India’s Citizen Environment & Consumer Economy’ (ICE 360° survey 2016) shows that 73% of households belonging to the bottom quintile avail grains from the PDS. The proportion of households belonging to the top percentile that avails PDS grains is less than half that figure at 35%. The PDS gets higher approval ratings from the poor than the rich. 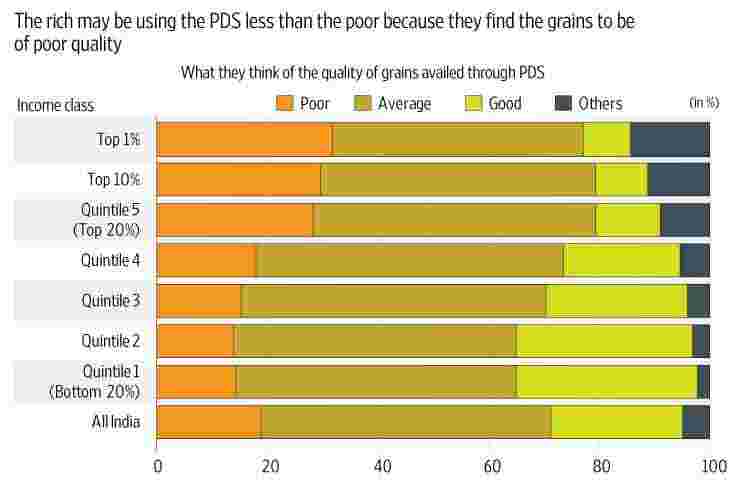 A third of the bottom quintile (the poorest 20%) rated the quality of grains availed through the PDS as good while only 12% of the top quintile (the richest 20%) thought the same. Among the top percentile (richest 1%), the figure was even lower at 9%, the ICE 360° survey shows. 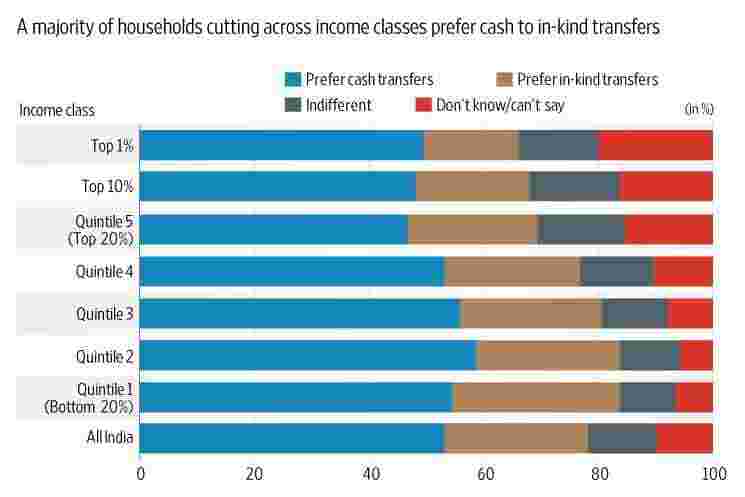 Nonetheless, even the poor seem to favour a shift to cash transfers, the survey shows. The ICE 360° survey is among the largest consumer economy surveys in the country. The response period of the survey was April 2015 to March 2016. The survey also elicited the opinion of respondents on the central and local governments. The responses on such questions reflect the opinions on the date of the survey and so reflect the mood of the people in the middle of the year when the survey was conducted. The responses show that a majority of respondents considered the performance of the central government to be average (rating it between 4 and 7 on a scale of 10) while a little more than a third rated the performance highly (rating it between 8 and 10). About 7% respondents assigned a low rating to the performance of the central government (rating it between 1 and 3). Local governments (municipal bodies and panchayats) received lower ratings compared to the central government. Among the poor, disapproval of the central government seems to be higher, with 10% of the bottom quintile rating the performance to be low, and 31% rating it high. 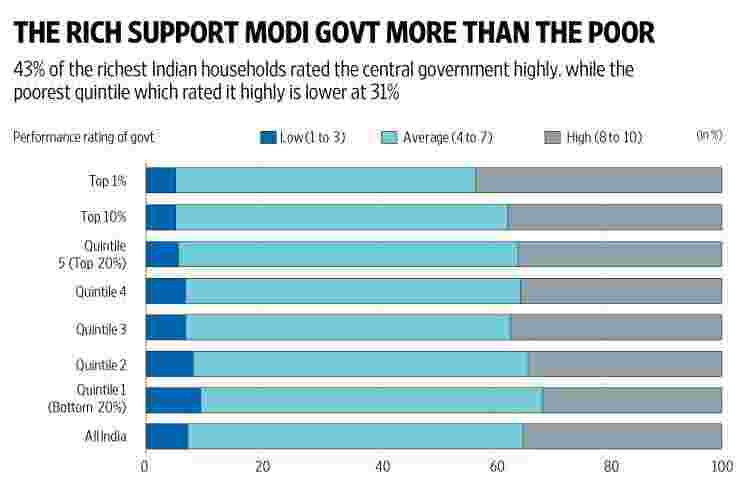 A much higher proportion of the top percentile rated the central government highly and a lower proportion rated its performance as low, indicating greater support for the Narendra Modi-led government among the super-rich. The survey does not tell us whether these preferences have shifted after the government scrapped high-value banknotes on 8 November. The survey also suggests that class and caste are the biggest grounds for discrimination in the country. 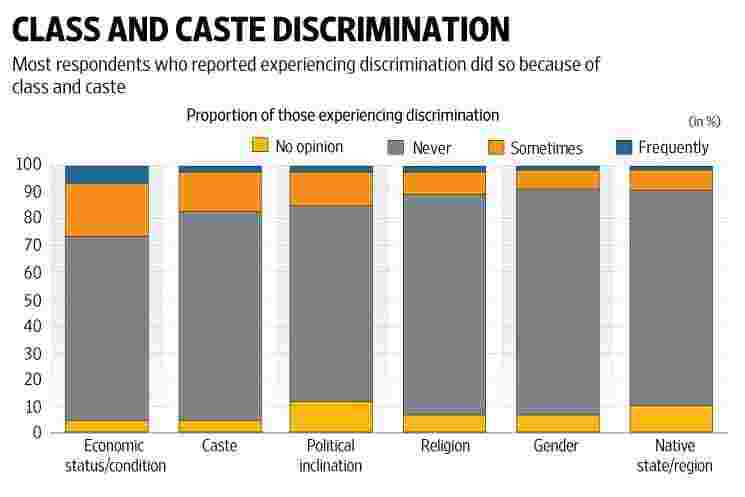 More respondents reported facing discrimination on the basis of class than on the basis of caste nationally while more reported facing discrimination based on caste than on the basis of religion, language, or gender, according to the survey. 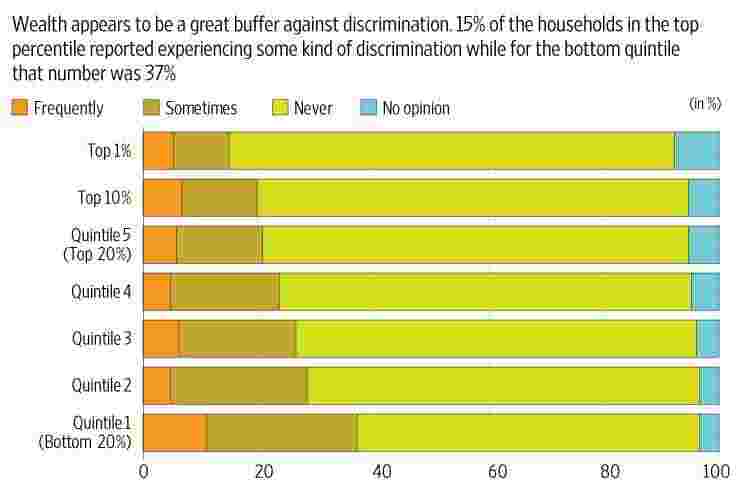 About 26% respondents reported experiencing discrimination (either ‘frequently’ or ‘sometimes’) on the basis of class or ‘economic status’ while 17% respondents reported experiencing caste-based discrimination. Among scheduled caste (SC) households, 21% reported facing caste-based discrimination while 28% reported facing class-based discrimination. Among scheduled tribe (ST) households, 25% reported facing caste-based discrimination while 31% reported facing class-based discrimination. The ICE 360° survey shows that India’s largest welfare scheme, PDS, not only reaches the poor more than the rich but it also confers greater benefits on the poor. The average amount of grains (rice and wheat) availed by households in the bottom quintile in an average month during the response period was 25kg while that availed by households in the top percentile was 18kg. Over the past few years, empirical studies by a number of economists have shown that PDS leakages have fallen over time even as its coverage has expanded. As an earlier Mint analysis based on National Sample Survey Office (NSSO) data showed, the PDS has become more progressive over the past decade. Yet, despite the progress, leakages continue to plague the PDS. As the ICE 360° survey shows, the PDS suffers from both inclusion and exclusion errors. On the one hand, a third of those in the top percentile, and more than half of the top quintile access PDS grains. On the other hand, more than a quarter of those in the bottom quintile are unable to access PDS grains. Perhaps it is because of these limitations that a majority of respondents reported that they would prefer to receive cash transfers ‘which is enough to buy equivalent ration from the market’. About 54% of households in the bottom quintile prefer cash transfers while 29% prefer in-kind transfers of foodgrains, according to the survey. Among the top 1%, half reported a preference for cash transfers while 16% preferred the existing system of in-kind transfers. Overall, 53% of households said they preferred cash transfers to the existing PDS while 25% expressed a preference for the existing system saying that a shift to cash transfers will be harmful. The urban sample of the survey is comparable to that of the National Sample Survey Office (NSSO) consumer expenditure survey conducted in 2011-12. While the NSSO surveyed 1,01,651 households, of which 41,968 (41.3%) were urban households, the ICE 360° survey covered 61,000 households, of which 36,000 (59%) are urban households. The rural sample of the ICE 360° survey is less than half of the NSSO sample. Nonetheless, all the estimates of each region have been derived by adjusting for the respective population of those regions. This is the concluding part of a 16-part data journalism series on how India lives, thinks, earns and spends, based on the latest results from the ICE 360° survey (www.ice360.in/) conducted by the People Research on India’s Consumer Economy (PRICE) in 2016.